Its two years since the show first appeared on YouTube, and this show marks that occasion by looking back over the last 24 months. In this episode we take a look at the news from May 1985. We compare arcade clones for one of the all time great blasters - Defender. We review some older games. We take a look at a newer game and end the show with Type-In Corner. The theme for your three-hour picture should be "One day in a life of a raccoon". On Saturday, from 9:00 to 12:00 GMT, there's going to be a realtime graphics competition going on. 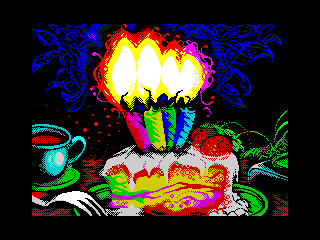 The theme will be announced then, and shall be reposted to Speccy Live, so stay tuned! Welcome to episode 82 of The Retro Asylum, the UK’s No1 Retro Gaming Podcast. In this episode your hosts are MrSid aka Sam and PressPlayOnTape aka Steve. The guys take a look at one of the most popular game developers/publishers ever; Ocean Software. Starting in 1984 where it all began, and then working their way through the years right up until 1998. The Spectrum Show 16K Edition. Invaders by Artic Computing 1982. Is this a poor character based jerk-fest or one of the best Space Invaders games for the Spectrum? The Spectrum Show 16K Edition. 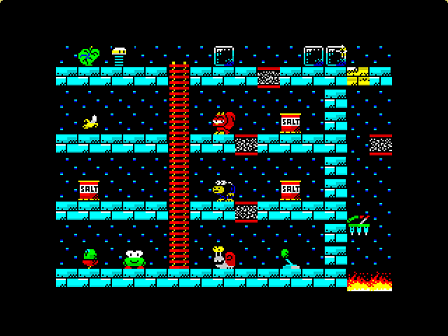 Ghost Hunt by PSS 1983. Could this be some spooky game of terror or just a below average pacman game? You are El Stompo, TV repair thing of some considerable repute. Your job is very hazardous but you are very skilled. Fix all the tellies on each level by stomping on them, sounds easy? Well with a lethal mix of arcade and puzzle you'll find yourselves challenged.